Hours: 7am - 9pm, but our Managers are on site 24 hours to assist. 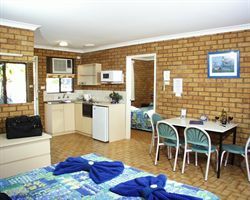 The Cervantes Pinnacles Motel is a quality, friendly style motel with units to suit couples or families. Self-contained or executive suites for adventure seekers or the corporate traveller. Our fully licensed restaurant boasts locally caught Western Rock Lobster, amongst a host of other seafood delights. Free wireless internet from our relaxing alfresco cafe, with the best coffee in town. The Cervantes Pinnacles Motel is a quality, comfortable motel with units to suit couples or families. Self-contained or executive suites for adventure seekers or the corporate traveller. Our fully licensed restaurant boasts locally caught Western Rock Lobster, amongst a host of other seafood delights. Unit for Families with shared bathroom off main bedroom. Main room has queen bed & full kitchenette, separate bedroom with 2 x single beds (or another queen bed on request). tv with foxtel, aircon, heating, BBQs just outside. Swimming pool, Fully licensed restaurant/bar. Free wireless internet from our on site Cafe. Self-Contained pool side. 1 queen bed. Full kitchen. Ensuite bathroom. Standard double suite with queen bed, ensuite bathroom, tea/coffee facilities, tv, aircon-heating, foxtel. Free Wireless internet from cafe on site. Fully licensed restaurant, bar. Bbq facilities, swimming pool. Cot available $20. Extra person ok on single or foldaway at $20. Our friendly staff here to ensure a memorable stay.